Why not send one of these adorable cream teddy bears and make someone special smile. He comes with a brown gingham ribbon tied round his neck and has a big brown nose and white paws. When he's sitting down he measures approximately 11 inches tall. They are very soft and are suitable for the very young to the young at heart! 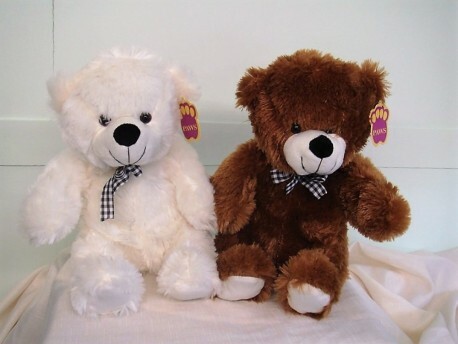 So if you know a good home for one of these cute cuddly bears, and know someone who would just love him, order one today! This bear is also available in a chestnut brown colour.